Weekend Getaway of Fun in the White Mountains! You must be a member of the Boston Singles Connect Group to attend this activity. Would you like to join this group? Don’t let Winter get you down - take a mini-break to the White Mountains in New Hampshire for a weekend of great skiing, snowboarding, hiking, shopping, and lots of socializing with new friends! 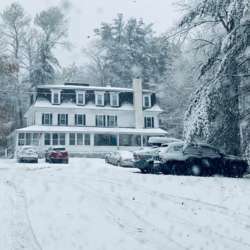 The Wedeln Ski and Outdoors club, located in Intervale, NH, offers an all season ski house with lodging for its members and guests. It is self-organized and their philosophy has always been about having fun and meeting new people! It started as a ski club but now offers many outdoor activities. * Saturday: Ski/snowboard ($45 special price @ Attitash) followed by aprés ski fun! All levels welcome! Guests must be 21+. Lodging is $25/night, bunk style sleeping in shared rooms. This weekend is limited to 6 guests. Please register by Jan 22nd so I can get a final count. For more information on the Wedeln Ski Club: Protected content . Please reach out to me with any questions. I will create a group message to those who register so we can better coordinate arrival and questions.